It may be hard to remember now, but there was once a time where the only scandal coming out of the White House was the President lying about his crowd sizes, as opposed to the President lying about, well, everything, all the time. 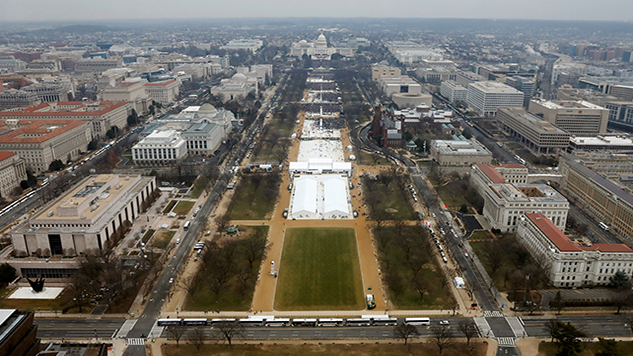 It now appears that Trump’s lie about his inauguration attendance was twofold: According to recently released documents, the President knowingly ordered the photos be edited to make the crowds appear larger. If you’re having a hard time remembering the details of that very first Trump scandal, a refresher: Following Trump’s Jan. 2017 inauguration, then-press secretary Sean Spicer attacked the media in his very first press conference, claiming they “engaged in deliberately false reporting” when describing the crowd size. In what is now a clearly Trump-dictated moment, Spicer claimed that “this is the largest audience to ever witness an inauguration, period, both in person and around the globe.” Of course, pictures and public transport numbers contradicted that claim, and the scandal was soon forgotten in the face of new ones. But, according to documents obtained by The Guardian, Trump tried to have the photos manipulated to appear more impressive. On Jan. 21, 2017, the President personally called the director of the National Park Service Michael Reynolds to order that he submit more photos, following a comparison between his crowd and Obama’s 2009 crowd that had begun to circulate online. While this whole thing seems comparatively quaint now, it’s clear that Trump provided us with a blueprint for his MO immediately upon taking office. First there’s a bald-faced lie, followed by an attack on the media, followed by attempts to force the narrative onto reality with tactics that are suspiciously reminiscent of totalitarianism. And of course, the petty one-upmanship of claiming his crowds were bigger than Obama’s. Really, the whole crowd size scandal was just an appetizer for what was still to come.